American manned Mars orbiter. Study 1969. NASA had the long range goal of sending men to explore the planet Mars. Status: Study 1969. Gross mass: 100,000 kg (220,000 lb). Height: 33.50 m (109.90 ft). Diameter: 6.70 m (21.90 ft). Span: 10.00 m (32.00 ft). To assure that the developments undertaken as part of the Space Station program contributed to this long term goal without undue increase in program cost or complexity, an assessment was made to determine where common or near common requirements existed. Two manned Mars missions, a 1981 opposition class mission and a 1986 conjunction class mission, were selected as representative types about which to develop total vehicle and operational concepts. These concepts involved the use of two Nuclear Shuttles for Earth departure and a third Shuttle to accompany the planetary spacecraft for use in braking into Mars orbit, in Mars orbit departure and in braking into a highly elliptic Earth orbit. 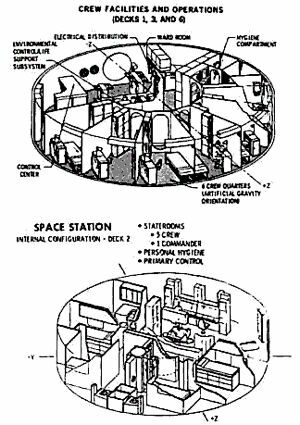 Although complete spacecraft concepts with Mars excursion modules and probes were laid out by both Phase B contractors, the principal effort was devoted to the so-called mission module which housed the living quarters, command and control, and laboratories. These were 10 m in diameter, utilized isotope Brayton power generation systems, and had centrally-located radiation shelters. Both contractor design teams concluded that substantial commonality could exist between the postulated planetary mission and the Earth orbital mission, particularly in habitability and long life system approaches. Non-commonalties of station and planetary mission module (PMM) were based on several unique interplanetary mission characteristics or requirements. The long mission duration, with no practical feasibility of resupply, demands larger storage volumes in the PMM. Maintenance philosophy, in the interest of weight constraints, emphasized repair over throw-away and replacement from spares supply; while at the same time requiring considerable spares storage. The fact that the planetary spacecraft may approach the Sun as closely as 0.5 A.U. requires resized of the environmental control system radiator to operate satisfactorily at 4 times the solar constant near Earth. Maximum solar distance may be as large as 1.8 AU This rendered solar cell arrays unsuitable, considering a required power level of 25 kW. It also necessitated greater meteoroid protection. 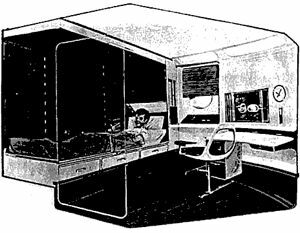 The consequences concerning solar flare exposure outside the geomagnetic shield created the need for a radiation shelter arrangement. The use of a two-vehicle buddy system for mutual self-rescue and survive required that each PMM store provisions for a crew of 12 while housing 6 under nominal conditions, thus providing still more ample shielding. The planetary mission plan called for the use of Mars Surface Sample Returners (MSSR) and manned Mars Excursion Modules (MEM). The resulting exposure to Mars material required special provisions to avoid possible backward contamination. Crew Size: 6. Habitable Volume: 930.00 m3. Electric System: 25.00 average kW. Family: Mars orbiter, USA - Space Stations. People: McDonnell. Country: USA. Spacecraft: Von Braun Mars Expedition - 1969. Agency: NASA, North American. Bibliography: 481.